Grenada consists of the island of Grenada, the most southerly of the Windwards in the Eastern Caribbean, and some of the southern Grenadine islands, the largest of which is Carriacou (33 sq km). Its Caribbean neighbours include St Vincent and the Grenadines (which includes the more northern Grenadines) and Trinidad and Tobago. The tropical climate is especially pleasant in the dry season (February to May) when the trade winds prevail. The rainy season runs from June to December, when hurricanes may occur and in some years – for example, Hurricane Ivan in 2004 – cause extensive damage. The temperature and rainfall vary with altitude, with much heavier rainfall in the mountains. 105,000 (2012); 39 per cent of people live in urban areas. The population growth rate stood at 0.4 per cent p.a. between the years of 1990 and 2012, depressed over this period by emigration. In 2012 the birth rate was 19 per 1,000 people (28 in 1970) and life expectancy 73 years (64 in 1970). Most of the population is of African (82 per cent in 1991 census) or mixed African/European descent (13 per cent). The remainder is made up of small European and Asian groups. 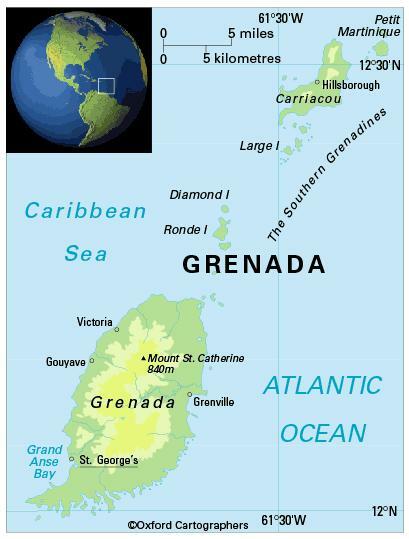 Grenada is classified as an upper-middle-income economy by the World Bank.